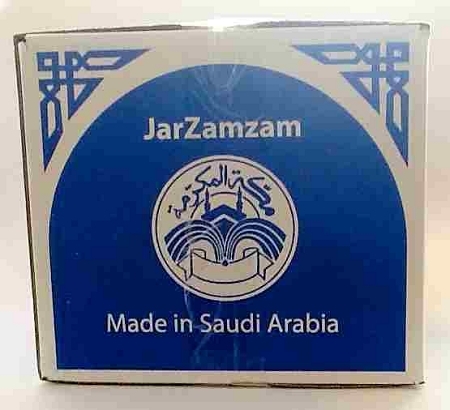 Individually packed & sealed Zam Zam jar. Jar contains 500 ml of Zam Zam Water. Bottled in Makkah Al-Mukarramah, Saudi Arabia inshallah. Makes a great gift for family and friends. Packaged for and Imported by M&A International Marketing Inc., Lorton, Virginia for the last 12+ years. Al-Rashad has visited the Lorton warehouse and seen the documentation that the water was indeed imported from Saudi Arabia. 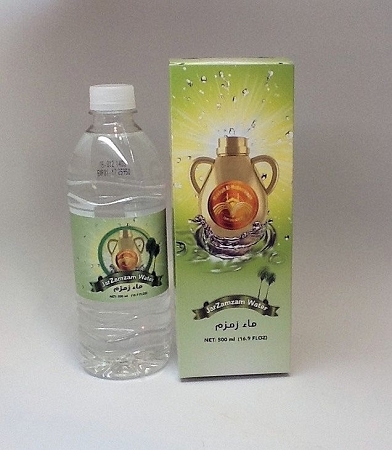 Inshallah this is genuine zam zam water. May Allah provide you the benefit that you and your loved ones seek by drinking this blessed water. Available also in cartons of 12 x 500ml bottles and pallets of 112 cartons (112x12x 500ml bottles). Available inshallah now on ongoing basis. Both Bukhari and Muslim confirm that the Prophet (peace and blessings be upon him) drank the water of Zamzam and said, “It is blessed (water); it is food for the hungry, and a healing for the sick.” It is reported that the angel Jibreel washed the heart of the Prophet (peace and blessings be upon him) with its water on the Night Journey. A person drinking Zamzam water should intend and hope to be healed, and obtain its blessings and whatever is best for him in this life and in the Hereafter. It is desirable that one should drink Zamzam water in three breaths, face toward the Qiblah, drink as much as possible, and praise and thank and supplicate to Allah. Ibn `Abbas reported that the Prophet (peace and blessings be upon him) said,"The water of Zamzam is good for whatever one intends (while drinking it). If you drink it seeking health, Allah will give you healing. If you drink it to satisfy your hunger, Allah will satisfy your hunger. If you drink it to quench your thirst, Allah will quench your thirst. Zamzam is a well dug by the angel Jibreel by which Allah quenched the thirst of Isma`il." This was reported by Ad-Daraqutni and Al-Hakim who added, "And if you drink it seeking refuge with Allah, Allah will grant you refuge." Ibn `Abbas used to supplicate Allah, whenever he drank Zamzam water:"Allahumma inni as’aluka `ilman naïf`an wa rizqan wasi`an wa shifa’an min kuli da’in (O Allah! Grant me beneficial knowledge, bountiful provision, and a healing from every disease)." After Islam, this powerful ability to quench thirst and fill stomachs remained. The Prophet said: "The best water on the face of the earth is the water of Zamzam; it is a kind of food and a healing from sickness." According to the Muslim collection of Hadith, Abu Dharr Ghifari, a Companion, noted that when he first arrived in Makkah during the early days of Islam, he survived only on Zamzam water for a whole month. Not only did he satisfy his hunger and thirst, he became obese. 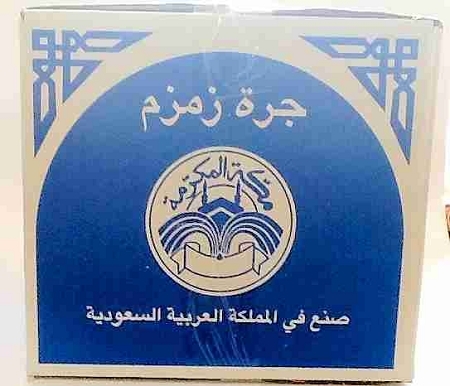 Apart from its ability to serve as satisfying food and drink, Zamzam water's health benefits are also commended. The Prophet said it was a healing from sickness. This is why pilgrims to Makkah to this day collect it in bottles to bring for relatives and friends back home who are ill. 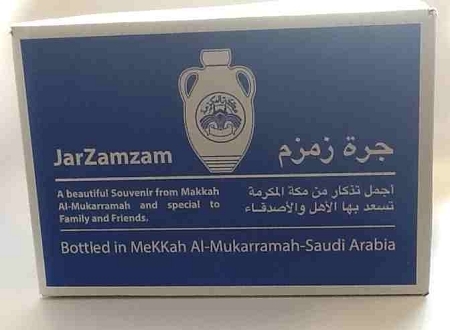 The Prophet used to carry Zamzam water in pitchers and water skins back to Madinah. He used to sprinkle it over the sick and make them drink it. To be able to acquire and drink genuine zamzam water from Makkah is a very special privilege and event. The water comes in a very nice and sturdy embossed plastic container similar in design to older pilgrim's flasks, and is also labeled with the date of bottling. The packaging is completed with a colorful, light cardboard box. The bottles I ordered came well packed and protected, and Inshallah, I will look forward to ordering more. Very good product. Came in a clear bottle shaped like the one in this picture. Very nice and authentic ZamZam water!